Thirty minutes at most, according to the wisdom of the crowds. That comes from reams of data and piles of research that suggests commute times tend to cluster around this point. People tend to be good at weighing their options, economists think. If you live farther from work, you can usually afford a bigger house or apartment. But there’s a point where that journey becomes too onerous, and you are willing to sacrifice some of those desires to live closer to your job. That point on average seems to be between 20 and 30 minutes. I was inspired to look into this further after seeing an article by Charlie Gardner over at his blog, The Old Urbanist. Gardner had mined the American Community Survey for average commute times in major metropolitan areas. Though there was a tight correlation between population and commute time (metros with larger populations have longer average commutes), the differences weren’t pronounced. They ranged from a low of 22.5 minutes in Kansas City to a high of 34.6 in New York City. That’s not a lot. But before we ask why commute times hover in a tight band, perhaps we need to ask why people commute so far in the first place. Why not work next door? The answers may seem obvious, but what’s readily apparent to one person may not be to another. That’s why we examine these things scientifically. Well, in this case your hunch is probably correct. An older study by Martin Wachs and his colleagues at UCLA found, unsurprisingly, that people choose where to live not just based on commute times but also neighborhood characteristics, schools, and safety. Now we can move on to the more curious question, why commutes tend to average 20-30 minutes. It’s not just limited to the United States, either. In the Netherlands, the average commute time in the early 2000s was about 28 minutes. Many European nations average about 35 minutes. What makes a half-hour so universal in terms of commuting? It didn’t used to be that way. Average commute times in 1980 were around 22 minutes. Today, they’re around 25 minutes. Three minutes may not seem like much, but remember it’s an average. To increase an average by that amount, some commutes had to grow significantly to counter those that shrunk or remained the same. Now, keep in mind there is a lot of variation about those averages. Some people travel 2 minutes to work, others well over an hour. But on average, they have increased. What’s causing that lengthening is higher job densities in major metros. Job growth is requisite to economic growth, and vice versa. As metro areas add more jobs, those jobs tend to be concentrated in business districts (after all, not everyone can work out of their homes). And as business districts fill up, commute times lengthen because the roads leading there become more congested. So when the economy booms, traffic slows to a crawl. I heard anecdotal evidence of this when I lived in San Francisco. People told me, if you think traffic is bad now, it was much worse during the tech boom of the late 1990s. When all those tech workers lost their jobs, gridlock practically evaporated, they said. Subtle changes in urban form may also cause longer commutes. One study in the Netherlands and another in Quebec, found that polycentric metro areas—those with two or more cities, like Minneapolis-St. Paul—tend to have longer auto commute times. As cities grow and begin bumping into one another, such agglomerations are likely to become more common. It’s possible commute times may increase as well. While there may not be consensus on this point, I haven’t found any studies that claim changes in urban form will shorten commute times. That makes sense if you look at somewhere like New York City, which is both monocentric and dense. People may work a short distance from their homes, but traffic is so congested and public transit makes so many stops that commute times are still relatively long. Simply increasing density in some cities may shorten commutes for a brief period, but the honeymoon won’t last forever. Which is a bummer, because for the most part people think their commutes are too long. A survey of 2,000 commuters in the San Francisco Bay Area reported that 52 percent of respondents said they commuted at least 5 minutes longer than they would like. Among that group, median commute times were 40 minutes, which is certainly longer than the region’s average. On the other hand, 42 percent said their commutes were just right (their median time was 15 minutes). Surprisingly, 7 percent felt their commute was too short (median of 10 minutes). But despite the fact that a majority think their commute is too long, most people said they didn’t mind it, so long as their trips were less than 100 miles. 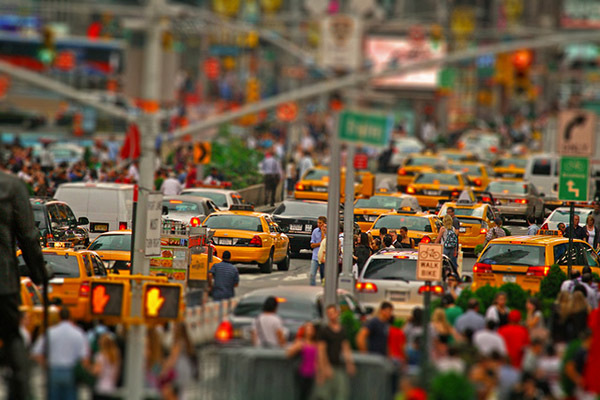 That people don’t mind their commute may be why commute times refuse to shrink. People in the Bay Area survey who didn’t mind their commute said they agreed with statements like, “I use my commute time productively” and “My commute trip is a useful transition between home and work”, which supports anecdotal evidence I’ve heard that people enjoy the separation between work and home. Twenty to thirty minutes may be just enough time to unwind. It’s not entirely universal, though. Tolerable commute times seem to lengthen when people switch from cars to mass transit. People may find that time more productive, or maybe the time seems shorter because driving can be stressful, while just sitting usually isn’t. Personally, I know I’m willing to commute longer by train than car. Another reason is because mass transit commutes tend to be more reliable in terms of duration (at least for trains). Not having to worry about traffic jams doubling your commute is a big advantage. Regardless of mode, people seem to settle on an ideal commute time. And once they have settled, they don’t seem to stray from it. A study of two metro areas in Washington State discovered that commute times don’t change much when people move or switch jobs. The thinking is that if a person gets a new job that’s farther away, they are more likely to move. Plus, as people have moved to suburbia, some jobs have followed. It’s a two-way street. But that doesn’t mean employers can move to the burbs without consequences. If an employer moves and an employee doesn’t move as well, the employee is more likely to find another job. Companies looking to relocate simply to cut costs may find the high turnover that results more costly in the long run. Commuting is a big part of our lives, so it makes perfect sense that it would affect so much of the world around us, especially the cities we live in. Take a dense city like New York that has oodles of jobs, and lots of dense housing close in. That density helps keep commute times reasonable. But somewhere like Tulsa that doesn’t have as many jobs doesn’t have as much need for density. Form follows function, and currently the freeways in Tulsa are functioning pretty well compared with New York. That presents a real dilemma for urban planners, who have been striving to increase densities in cities across the board. One approach has been mixed-use development that blends retail, housing, and office space. That may help reduce trip times for errands and such, but it doesn’t preclude people from living in one mixed-use neighborhood and working in another. The reality is, we’re probably not going to change commute times. If we offer faster and better transportation, people will use it until it becomes overburdened. At which point they’ll just move closer to work. Attempts to influence urban form through design may not have much of an impact if jobs don’t follow.